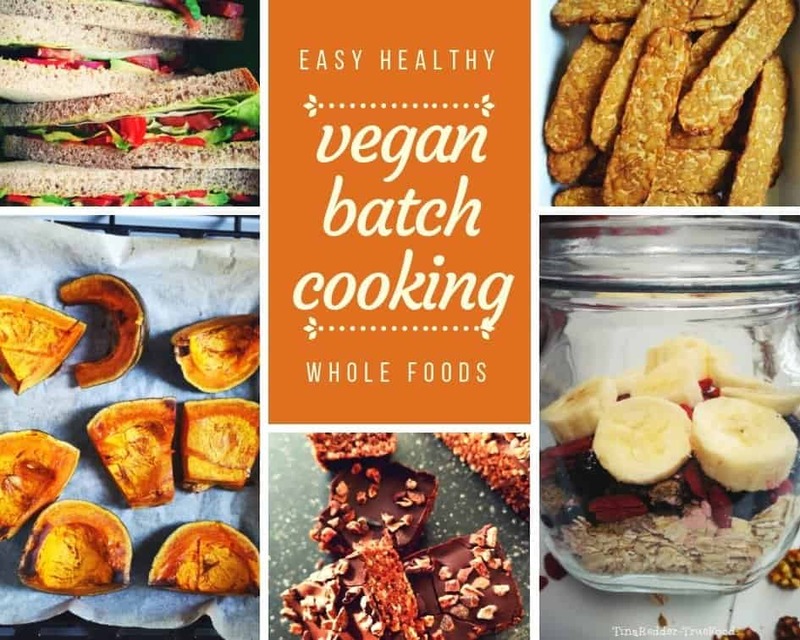 I know I need to do some vegan batch cooking … because I need quick delicious meals ready to go during the week. Because I have tried meal prep but don’t want to eat the same soup for 3 days. Because sometimes my family doesn’t eat the same as I do and if I cook for them I usually don’t have enough for myself. Because I want to enjoy nutritious, whole food, plant based meals with the least effort as possible. I do set some time aside for this activity but it does make such a difference during the week. 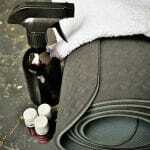 It is easier and more time efficient to do a lot of the same at one time than all spread out over the days of the week. 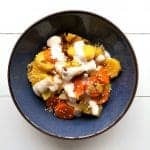 My intention with this post is not to give you concrete recipes or what to make but more to share how I do my batch cooking, to give you ideas. I mostly plan for 5 days, to make weekdays easier and suppler for everybody. And so much healthier. Breakfast is the easiest meal just think of ( overnight ) oats, granola, smoothies during summer. 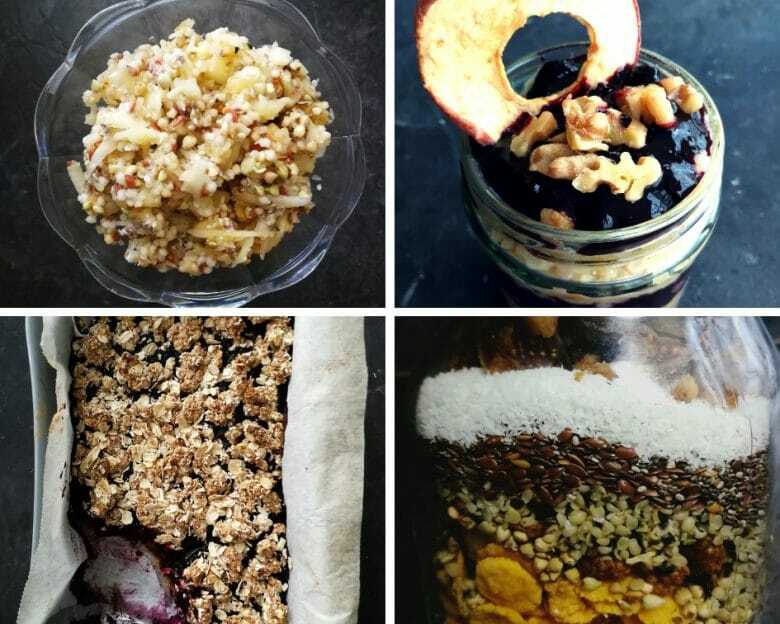 I do make some granola, sometimes muffins or some healthy bars for breakfast or for on the go. There are a few basics I always need to have in our fridge to be able to prepare quick meals. Always some ready to eat carb like quinoa, rice, potatoes, cooked or baked. 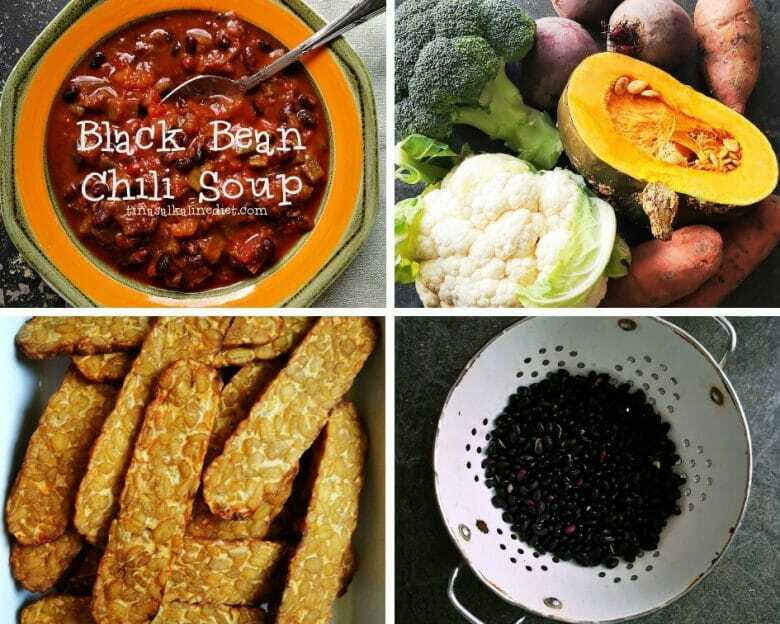 Beans, tofu, crispy tempeh or lentils for protein, cooked, baked or added to a soup or stew. Always some roasted veggies, love pumpkins, red beets, carrots, mushrooms. These are a great addition to a salad, a bowl or in a wrap. Washed greens, grated carrots, chopped spring onions. I discovered that I love, really, steamed broccoli and cauliflower. Not freshly cooked but the next day, cold, out of the fridge. With ketchup or dipped in a tahini or miso dressing. I can eat a huge bowl of it for a snack. Of course we need some sauces, I always have hummus, pesto or salsa and one or two dressings. Most of these stay good in the fridge for up to 3 days. Pesto can be frozen as can many other sauces. I also sometimes make a casserole ready to go and place it in the fridge until needed. Dinner meals can be pre-made burgers, pasta, soups, stews, bowls, salads, wraps etc. I plan it the way that during the first 3 days I use the ingredients I have already cooked or baked like the quinoa, rice, beans, steamed vegetables etc. The other days I make something new for which on my batch cooking day I prepare the ingredients, wash the needed vegetables, get everything ready to go. You can also buy pre-cut or frozen veggies for this. This already saves a lot of time but I also throw in my slow cooker or pressure cooker to make it even less of a job. These both can be set on a timer so they start cooking and your warm healthy dinner is done when needed. Think of plant based stews, soups, curries, comfort food. Some meals freeze well like soups or stews, these are great to make ahead. 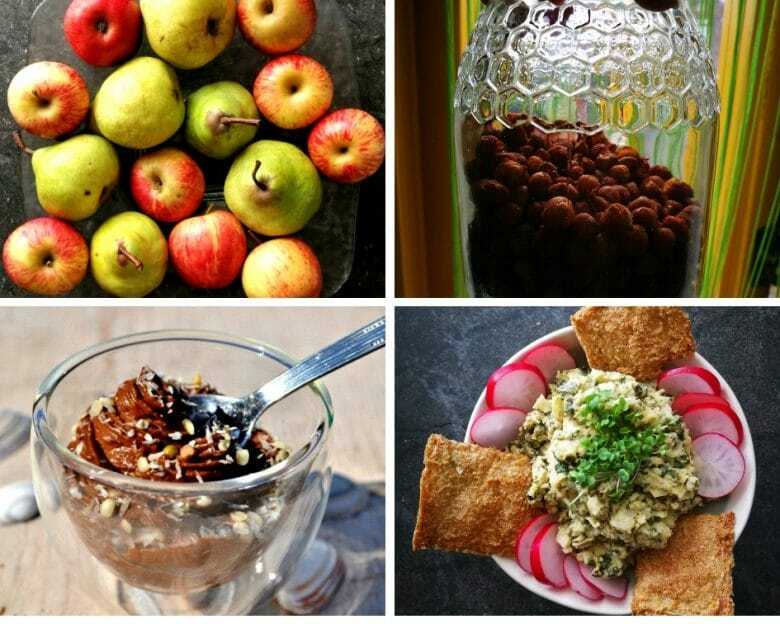 Snacks can consist of fruit, crackers, crunchy chickpeas, nuts, bliss balls, blueberry oat squares, granola bars, chia pudding or guacamole with veg or crackers to dip. I like to wash and clean my more labor intensive fruits like pineapples and pomegranates. And wash all other fruits as well. That’s a lot of food! I sometimes do my vegan batch cooking in two days depending on our plans for Sunday and do the other half on Monday. You also need some BPA free freezer or fridge containers with good fitting lids that keep the food fresh. You should of course adjust the amounts to your and your families needs. So, what meals can we make with these prepared foods during the next days?! I hope this helps you with eating more healthy meals without too much hustle! I have to do it this way, that is for sure and I keep my more elaborate meals for days when I do have time.